I'm a gardener who makes his own potting mix. It's not that I'm really fussy about the mix I use (I'm not), or that I don't think there are good bagged mixes available, because there are. I usually make my own mix for a few reasons, including being able to customize it for special needs, but usually to save money. I use a lot of potting mix during the course of a year, and mixing my own saves me some money. When I make the mix, the ingredients are typically bagged topsoil, Perlite, compost (leaf and stick mold), and peat moss. Recently I've decided to reduce my use of peat, and have started trying a material that is not too common in St. Louis: coir. 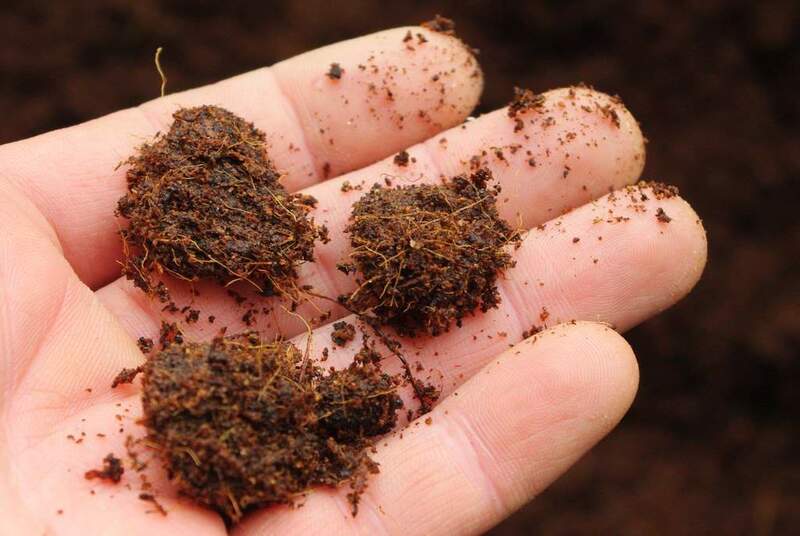 The peat moss that we get in the Midwest is harvested from ancient peat bogs in Canada, where primarily Sphagnum moss grows and over hundreds or thousands of years forms thick mats. It takes about 25 years to form one inch of peat. The bogs are drained to harvest, and what took Nature many, many years to produce is wiped out in a week or two and the peat bog ecosystem is destroyed. Although it seems that the Canadian government requires restoration of the bog after harvest, there's still some debate as to how sustainable peat harvest is. Personally it sounds non-sustainable to me, but I have to do more reading about this. 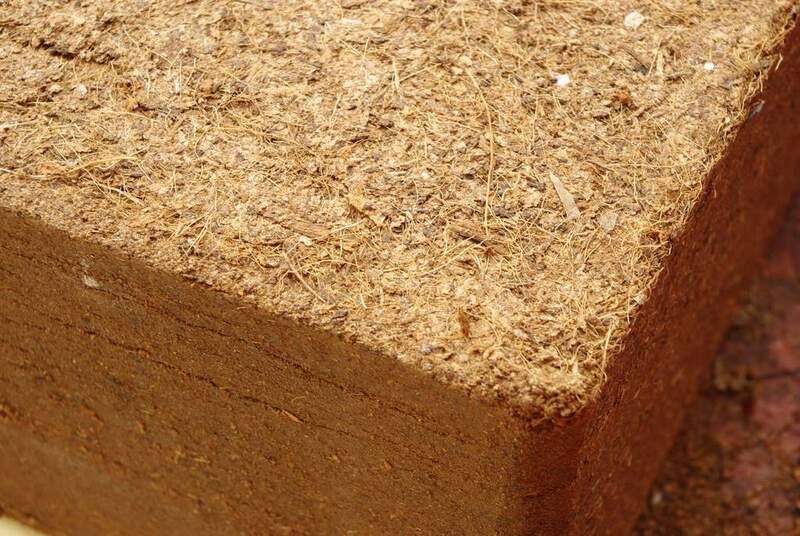 Coir is made from coconut husks, and is a remnant of the coconut processing industry. I think we all know that it doesn't take hundreds of years to grow a coconut, so this is definitely a sustainable product. The fact that the coir needs to be transported thousands of miles to get here offsets the environmental friendliness, but at this time it still seems to me like a "greener" solution than peat. The problem with coir is that it is not readily available locally, but I can get peat bales anywhere. Coir is also a bit more expensive than peat right now, but I can't tell exactly how much more expensive -- I'll get to that in a minute. The directions say to soak for 15 minutes, then fluff it up. 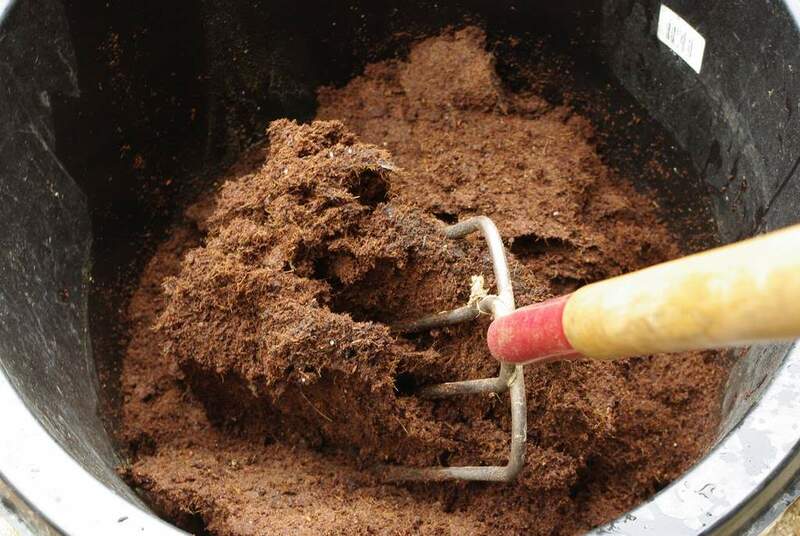 Peat moss comes in compressed bundles too, but they break apart much easier, and the small chunks break while the potting mix is being turned for the most part. It doesn't seem like these coir chunks will do that, and I'm not really keen on going through the whole pile breaking apart everything by hand. Since I haven't finished breaking apart the chunks, I'm not ready to compare the amount of coir that one brick makes. The label says that it makes 2.5 cubic feet when expanded. The peat bale is 3 cubic feet, but it looks like so much more than the coir when fluffed. I'll have to fluff an entire bale of peat sometime this summer to compare the volumes. I highly doubt that the coir block contains only 17% less than the peat bale, but I'll have to measure. Assuming that the listed volumes are accurate (2.5 vs. 3), let's look at cost. I can get the peat bale for $10, which is $3.33 per cubic foot. 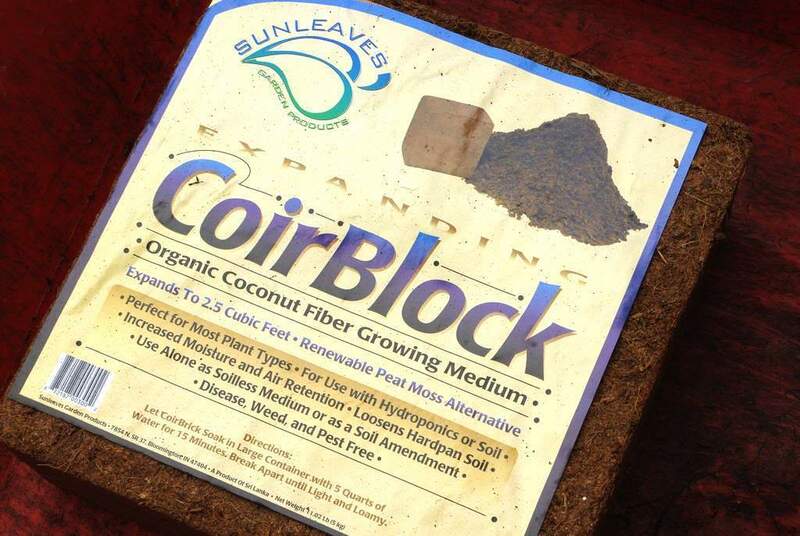 I can get the coir block locally (after a longer drive) for $13, which is $5.20 per cubic foot. Based on that, the coir is about 55% more expensive than the peat. That's fairly substantial. It seems that I can order coir bricks for delivery though, and they're only $8 each. Unfortunately, shipping is quite expensive -- If I order a single brick the shipping alone is $8 -- much too pricey to make it worthwhile. Shipping on four bricks was $16, but it seems that if I spend $49 on merchandise I can get free shipping from this one retailer. So interestingly if I order seven blocks, shipping is free and my total is $56 -- making the cost only $3.20 per cubic foot. The point of all of this is to say that price is not the problem -- even if I have to spend a bit more money to get the more sustainable product, I'll do it (there is a limit though). Right now the issue is convenience. there's no way I can afford to go through all of the coir by hand to break the clumps up. Even though it's going to be more work, I'm still going to give coir a try for at least the first part of the summer. I want to see how it performs in the potting mixes before I make a final determination, and need to know if the clumpy problem really is a concern. I'll post my results later this summer. 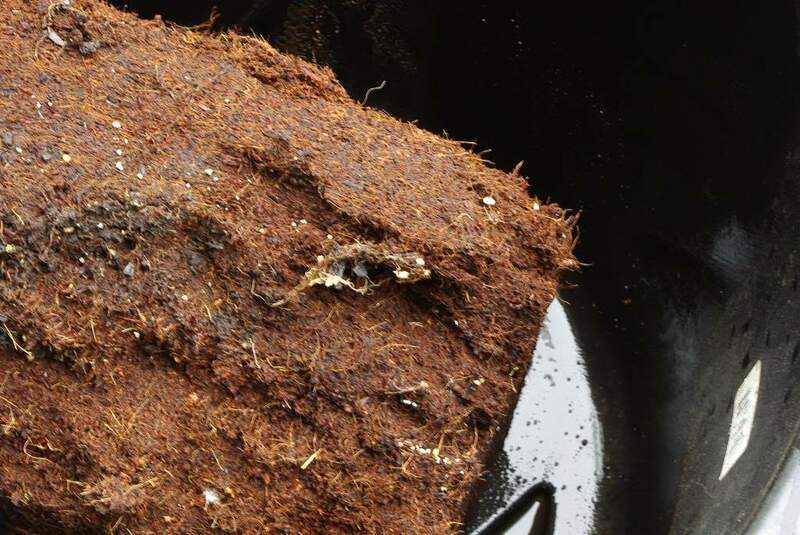 Just to be clear about my position on this, I don't think that peat moss should be avoided at all costs. There are some questions about the impact of its harvest, but I need to read up on it some more. I also don't know yet that coir is the perfect replacement for peat, at least where I live. But I've taken the first step and will learn more soon. Are there other "standard" gardening practices that I need to take another look at too? 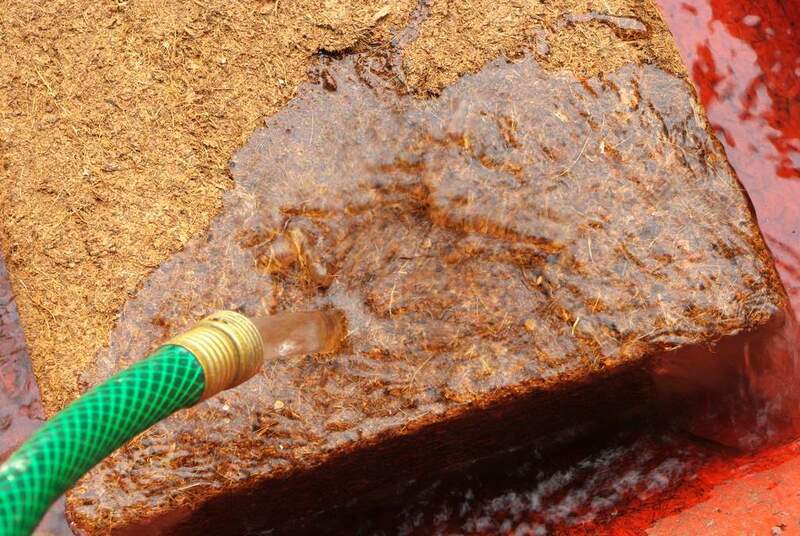 Alan, my experience with rehydrating coir is the same as yours (see here). A week at least. And yes, I did break apart the little clumps by hand, which took a while. I wish coir would come loose in large bags. Maybe someday it will. 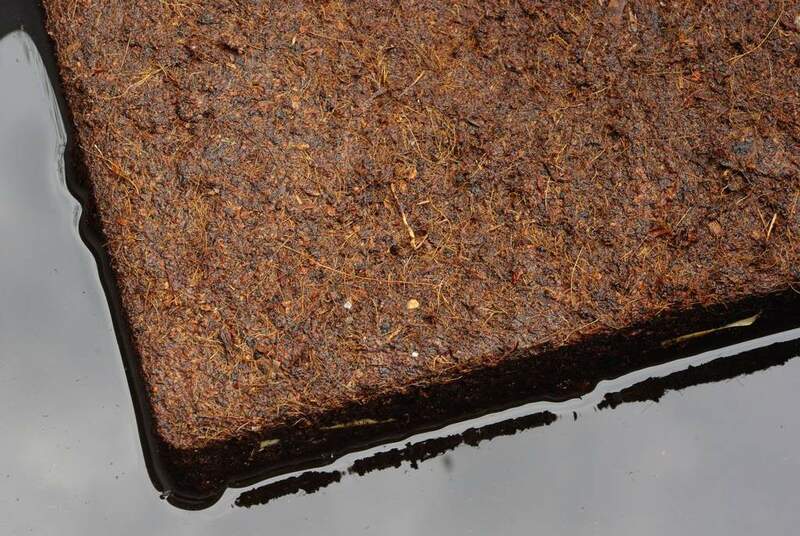 However, I do love working with it, especially since it is much easier to re-wet than peat, but availability is a real issue, as you pointed out. Alan, what a fantastic post. 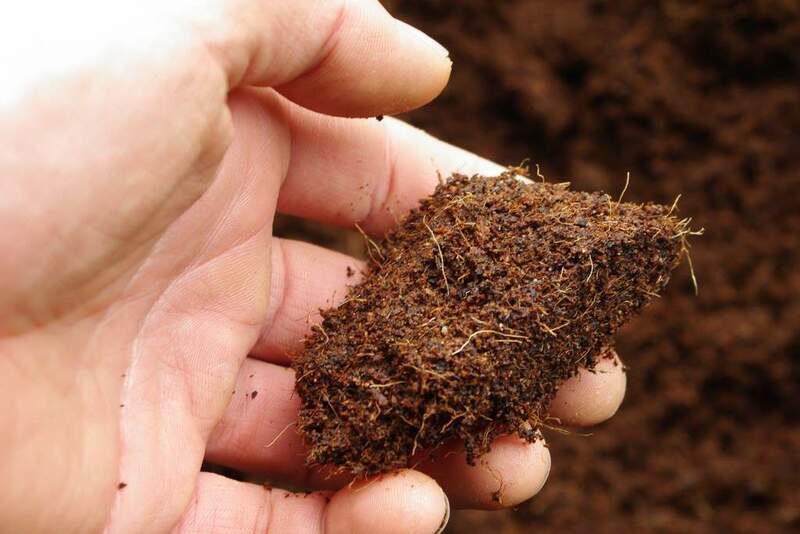 Peat moss vs. Coir has been on my mind lately and I learned quite a bit from this post! Thanks! I've read that coir sometimes has salt in it, from coconuts that are grown near the coast. That would make it unsuitable for some plants that are very sensitive to extra minerals, but a few good waterings probably would be sufficient for most plants. Owen: good info. I wonder how you can test this, and is the week-long soaking enough to dilute the salt enough to be insignificant? I'm really surprised your coir took so long to rehydrate. I've used to many times (here in Australia) and it takes about 10 minutes if I help break it up by hand, 20 if I leave it alone. Seems very odd! Like we're using a very different product although they are called the same thing. 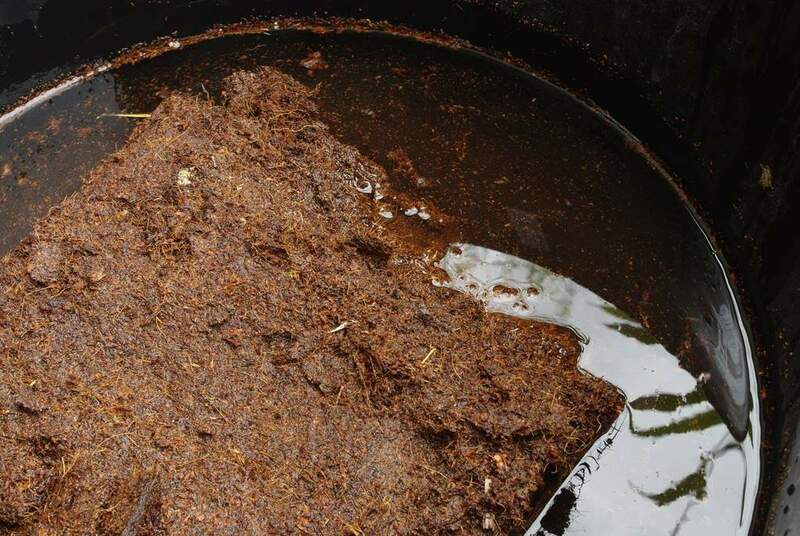 I always use boiling hot water to break down my coir and it only takes a few minutes before it looks ready to use. Obviously I let it become cold before I use however.